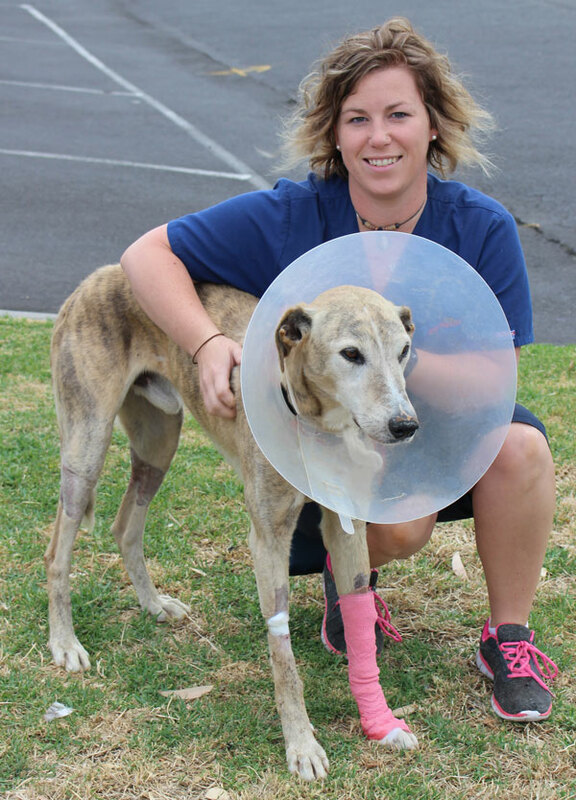 Rory presented to Warrnambool Veterinary after his owners found him unwell and surrounded by 2 dead snakes! It had been a very hot night and Rory had obviously played games with the Tiger and Copperhead or Brown snakes. On presentation Rory was in a bad way, he had vomited at home, was shaking a lot and barely able to stand. He was dribbling brown urine, panting and had large dilated pupils. Rory’s temperature was very high and he was almost unconscious. In this case the diagnosis was straight forward due to the snakes being found at Rory’s kennel. The initial treatment for Rory consisted of placing an intravenous catheter and starting intravenous fluids at shock therapy rates. 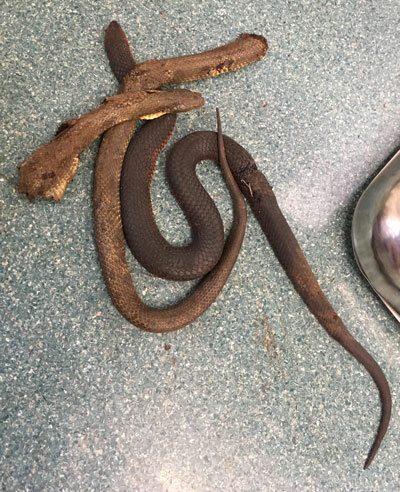 While this was done a blood sample was taken for analysis in our in-clinic pathology machine to check the status of Rory’s kidney and liver function, as well as a blood clotting time, which we use to both diagnose snake bite and to help determine the need for more anti-venom. Anti-venom was administered fairly quickly, a combined vial which contains the anti-venom for Tiger, Brown, Black and Copperhead snakes. Rory continued to deteriorate and following an hour of treatment he was given a 2nd vial of anti-venom, something which is not always necessary, although in this case probably saved his life. Over the next few days Rory remained stable however was still critical, was vomiting sometimes and unable to stand. There remained the risk of aspiration pneumonia and other complications. The treatment following snake anti-venom in such a bad case is supportive care with intravenous fluids and lots of nursing. Some cases may require the placement of a feeding tube. With a snake bite case we monitor the urine output as well as the amount of myoglobin in the urine which is a breakdown product of the muscle damage caused by the snake venom. This can be damaging to the kidneys and is the reason the animal needs to remain on intravenous fluids. Gradually Rory has improved and now has the strength to go for small walks and is eating well. He is wagging his big tail and we have all grown to love him! We are hopeful that Rory will be discharged from hospital in the next few days. We would like to thanks Rory’s caring and dedicated owners for giving us the opportunity to save him and for allowing us to share his case with the public. Read our companion article about the signs of snake bite, what to do if your animal is bitten, how the vet will treat your animal and some advice on avoiding snake bite.